You can learn how to precisely cut shapes including triangles, diamonds, hexagons, teardrops, gems and much more with 60-degree rulers. Learn more in the Class Description below. 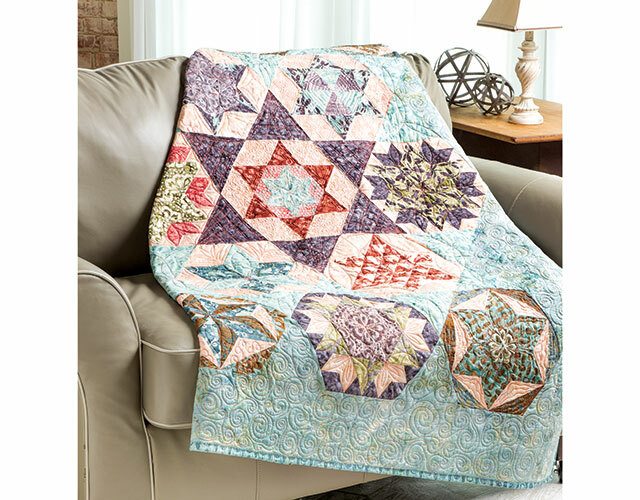 Beautiful star quilts made with perfectly cut triangles, diamonds, half-diamonds, trapezoids, hexagons, teardrops, gems and more are very popular among quilters. Now you can learn the secrets of cutting and piecing these shapes with expert Marci Baker in this Annie's video class, Learn to Quilt With 60-Degree Rulers. In this class, Marci explains in detail how to use two of the most versatile 60-degree rulers available -- Creative Grids and Clearview 60-degree rulers. What's special about these two rulers is that you can use either of them to cut all the shapes taught in this class, and then quilt those shapes together into 12 exquisite star quilt blocks. Choose fabrics with the right balance of light, medium and dark values. Save time and fabric with cutting shortcuts. Align, measure and cut shapes using the Creative Grids and Clearview 60-degree rulers. Cut beginner shapes including triangles, diamonds and half-diamonds. Cut more involved shapes including hexagons, trapezoids, teardrops, gems, flat pyramids and more. Press seams that lock together to reduce bulk and perfectly align. Attain perfect points without pinning. Work straight seams, set-in seams and easy Y-seams. 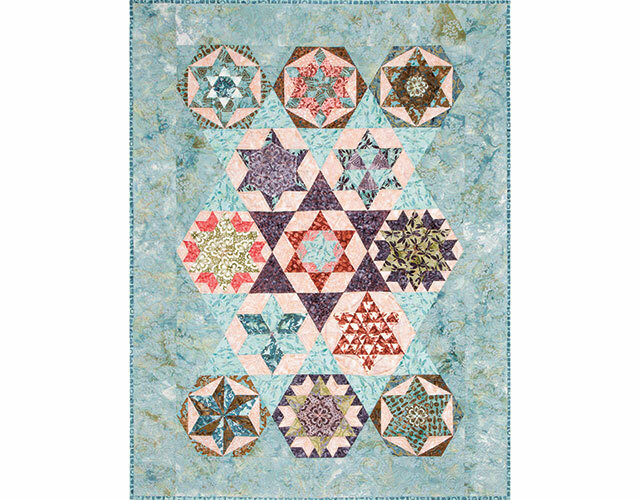 Class includes complete instructions to make 12 gorgeous star quilt blocks that come together in a beautiful Six-Pointed Star Sampler Quilt. Instructions are given to make the quilt as a lap throw, twin-, full-, queen- or king-size quilt. Excellent class with an abundance of information! Fast moving pace and accurate instructions. I would love to see more classes by Marci Baker! Very rich class, lots of tips and informations. Marcy covers all the aspects of the 60Â° angle piecing, I loved this class, I am sure I shall refer to it very often. Thank you so much Marcy for being so interesting. Marci Baker is an excellent teacher and her lessons are really interesting and understandable. I have never made anything with stars and triangles this way before. I thoroughly enjoyed her class and I am itching to start making a quilt using her techniques. I haven't felt so inspired in years. Thank you so much for this class. I will definitely be interested in any future classes by Marci. This is a brilliant class with a wonderful teacher. Marci is a very experience quilter with lots of knowledge on her skill so when I watched this video class I was so happy to learn a multitude of new techniques. I have never made star blocks like these before so it was great to learn how to make them. Now I have the confidence to make my own with Marci's help. Thank you for an excellent class! I absolutely love the fact that even though I bought this class 3 years ago I can go back and watch it over and over again and refresh my memory. Most Quilters know that you have several projects going at once and this is one I have had going for a while( still not finished) but I cannot wait to say how much I love block number 7, and 10 the star of diamonds because it gives me confidence to sew y seams easily without having to use pins or mark dots. Thank you, thank you Marci Baker for this clear, and easy to follow lesson. p.s. It was one year before I even bought the Clearview triangle but I'm so glad I did!